July 2018 Blackbird by Cooper Copter. Successful mission to digitalise a new nature reserve in Bavaria (Germany), covering 300ha in high resolution multispectral imagery. SKYLAB analyses the data for terrain and vegetation classification and to provide the basis for detailed future monitoring. July 2018 Interview with AQUILA CAPITAL's head of forest investment. 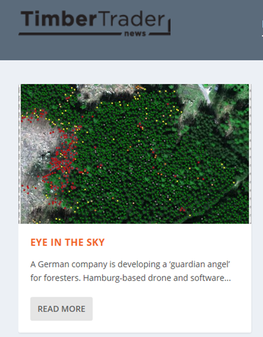 A testimonial for forest inventories made by SKYLAB. June 2018 Timber Trade News in Australia stirring an interest in SKYLABs pioneering work on the early detection of bark beetle in spruce forests using multispectral imaging. June 2018 McKinsey "Precision forestry: A revolution in the woods" underlines the potential of precision forestry to reduce costs and, more importantly, maximise yields and overall performance in commercial forestry and plantations. Exactly describing the technologies that SKYLAB is developing and applying in forest inventories and management today! 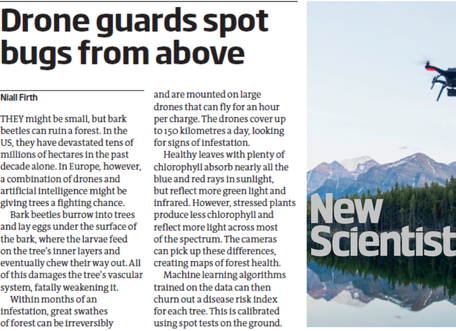 May 2018 New Scientist reports about SKYLAB work on stress and disease detection in trees, for example on bark beetle and potentially other plant diseases in orchards, vineyards etc.